1. In pursuance of Prime Minister’s announcement, Ministry of External Affairs organized 1st edition of Bharat Ko Janiye Quiz for young overseas Indians (two categories i.e. PIOs and NRIs) in 2015-16.The second edition of 'Bharat Ko Janiye' quiz with participation of 1,00,000 overseas Indian youth (two categories PIOs & NRIs) will be held in 2018-19. 2. The quiz is being conducted to motivate overseas Indian youth to enhance their knowledge about India. 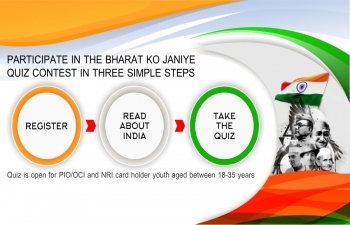 Bharat Ko Janiye Quiz is open for two distinct categories of participants - PIO & NRI between 15 to 35 years. Topics of the Quiz include – Indian Art, Indian Democracy, Economy, Geography, Personalities in Music and Dance, Science & Technology, Languages & Literature, Education, Tradition of Indian Crafts, Indian Cinema, and Renowned Personalities. 3. The entire quiz will be organized in 4 rounds. The first round of quiz will be executed by the Mission abroad during 19 to 21 July 2018. The top three contenders/participants of the 1st round of Quiz from each category of NRI and PIO, who will be eligible for the second round, will be given Medals by the Missions. 5. Top 10 finalists in each category (PIO & NRI) will be selected on the basis of marks secured in second round and they will be invited to participate in the third round (Semi final) and fourth round (Final round) in New Delhi. All participants, who are invited for onsite round would attend the workshop in New Delhi and participate in the Bharat ko Janiye Yatra, a 15 day tour of India. After Yatra, final onsite round will be held in New Delhi and top 3 winners will be awarded Gold/Silver/Bronze medals. 6. For more details, please visit https://www.bharatkojaniye.in/.